“Our software was developed in a multispecialty ophthalmology and optometrist setting. 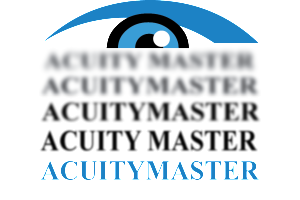 AcuityMaster permits you efficiently assess visual acuity and refract your patients in a precise, robust, yet affordable solution. If you’re still checking visual acuity with a snellen only projector rather than a computer eye chart with a myriad of optotypes and settings that only a computerized visual acuity system can provide, such as ETDRS, contrast sensitivity, worth-dot four test. Click below to download a fully functional demonstration version of AcuityMaster digital acuity system. Click here to download your 15-day FULLY FUNCTIONAL TRIAL of AcuityMaster software. Our team consists of ophthalmologists, optometrists, certified ophthalmic technicians and highly skilled programmers! Our software is state-of-the-art, designed from the ground up within .NET 4 framework, for use on Windows XP, Windows 7 and 8. AcuityMaster is optimized for use with either one or more display monitors. We are committed to improve and enhance our product to improve the quality of care your provide to your patients. Please email us or post to our facebook page with your suggestions. Please email us or post to our facebook page or Google Plus with your suggestions.